From Jessica: Korean Rice Cake is one of the traditional foods that have been eaten in Korea since the ancient times. It is made of rice and sugar, which is steamed to create a soft, chewy, rice cake. There are hundreds of different types of rice cakes such as sweet honey rice cake, red bean rice cake, rainbow rice cake, fried rice cake with cinnamon sugar, powdered bean rice cake, herb rice cake, and plain rice cake. There are hundreds more that can not be accurately translated into English, plus ones that are more in the modern style, or contain more sugar to make them sweeter compared to the traditional pieces. Rice cakes were the food for travelers long ago. They are used to honor our passed ancestors, or to celebrate birthdays or a wedding. The colorful rice cakes can be flavored with fruit to give bright colors, but the traditional ones are commonly made with herbs, beans, and honey. Thanks, Jessica, these look beautiful! I love learning about this kind of food, and it's especially nice to have a picture. It's interesting that there are so many varieties of Korean rice cake. 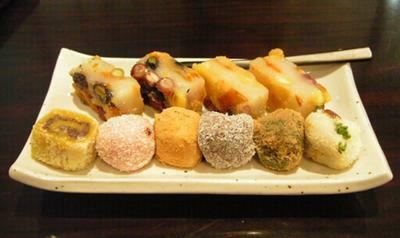 Some general categories of Korean rice cake are tteok, hwageon, and danja. Tteok alone has many categories: Sirutteok (steamed and sometimes mixed with other grains or beans), Injeolmi (pounded tteok), Songpyeon and Bupyeon, (molded and shaped). Hwajeon is a sweet rice pancake containing flower petals. Danja is another type with many variations containing ingredients like jujube, chestnuts, or gingko. Tteokbokki is a spicy dish commonly sold by street vendors that contains garaetteok, a cylinder shaped white tteok. Chinese rice cake varieties include: Nian gao (Chinese New Year Cake), Tangyuan (a type of dumpling), Erkuai (shaped like an ear), and Tainan Bowl Rice Cake, made in, you guessed it, a bowl. In South India you can find idli, a steamed rice cake, and puttu, ground rice layered with coconut. Japanese rice cake is called Mochi, and can be either sweet of savory. It is also popular in Hawaii, and can be found at many natural food stores in the US. Vietnamese rice cake varieties: Bánh bèo (savory-filled and steamed), Bánh bò (sweet, contains yeast), Bánh chưng (savory), Bánh tét (used to celebrate Tét, a Vietnamese holiday), and Bánh đúc (sweet in the south, savory in the north, and may be made with corn in North Vietnam). In the Philippines they also treasure rice cakes, often with coconut. In fact you can find them in many other Southeast Asian countries as well, especially Malaysia. Curious About Traditional Gluten Free Cakes? There are several versions of rice cakes, from Italy and Mexico. Join in and write your own page! It's easy to do. How? Simply click here to return to Contributions Asia.